One of the flavours we made for the Powerscourt Centre launch was chocolate truffle ice cream using Lorge chocolate truffles. Benoit Lorge is making some of the best chocolates in Ireland, and we’re delighted to support him. 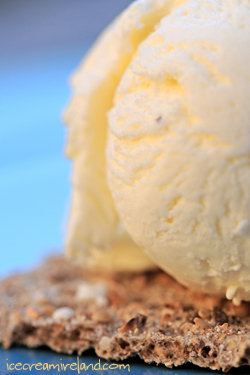 This ice cream really is one that creates “wow” factor. Since I posted a recipe for chocolate truffle ice cream in the past, I’ll simply point to it here, and you can use Lorge’s excellent truffles if you wish! I wrote a short time ago about how certain things have been so hard for us to find and the joy at finally sourcing items like decent waffle cones. This year seems to be the year of the find, for we’ve also come across an Irish company who does small print runs of custom printed takeaway coffee cups. Up until now, the smallest print run we could find was 10,000 units. I’m delighted with how the cups came out, and it’s the best of all worlds – not only are our takeaway coffees finally branded, but we’re able to buy Irish as well. If anyone else has been on the same search, the company is called Cup Print, they are in Co. Clare, and their website is here. 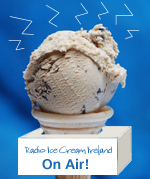 For anyone interested, I will be on Moncrieff on Newstalk at around 2:35 pm today, talking about ice cream. 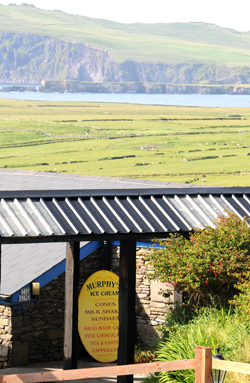 We now have a little Murphys shop in Tig Aine’s in Graig, Ballyferriter for the summer, and we’ll be serving ice cream, coffees, and some ice cream desserts in a cafe with one of the most beautiful views in Ireland. Hopefully it will make a pleasant stop for anyone heading around the Slea Head Drive. We hope you can stop in! 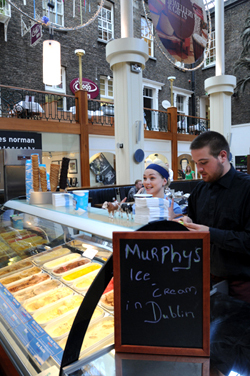 Yesterday, we had a party in Powerscourt Centre, to celebrate the first Murphys Ice Cream scooping cabinet in the capitol, and I think it was quite a success, due in no small part to our wonderful team (Niamh, Claire, Sinead, JP and Gary), our brilliant designer Kevin, and the folk at Powerscourt Townhouse Cafe. Certainly one of the high points for me was when JP brought two Kerry calves, which absolutely delighted children and adults present, and I was especially happy that our farmer Colm managed to make an appearance. It was a crazy day, including a tasting at Morton’s on Hatch Street, dropping into the studio to visit with the brilliant team at the Emergency on Newstalk, and trying to keep our little Róisín happy. The party itself flew by, and I only wish I could have split myself in 3 to chat with everyone who came. I hope that having the scooping cabinet will please our Dublin customers, and anyone who is interested in our ice cream should visit Powerscourt Centre. It’s our policy to give out free tastes, so don’t be shy! We’re just about up and running in Powerscourt Centre, where we will have the first Murphys Ice Cream scooping cabinet in the capitol. 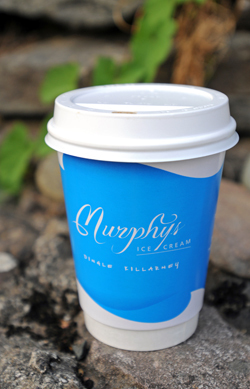 It’s a collaboration with Jay Burke’s Powerscourt Townhouse Cafe, and while we’ve been selling 500ml tubs in Dublin for a while now, it will give our Leinster customers a chance to have a scoop of Murphys without driving all the way to Kerry! We have a launch party this afternoon, and if you’re a fan of Murphys and in Dublin, click here. 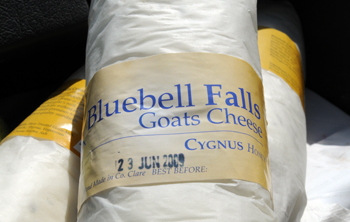 The first time I came across Bluebell Falls goat’s cheese was at Cafe Paradiso in Cork. I remember being blown away by the delicate taste and thinking it was surely one of the best soft goat’s cheeses I had ever had the joy of sampling. Since then, I’ve bought it whenever I could find it, which isn’t too often when you live in the wilds of West Kerry. When we started thinking about what Irish foods we wanted to turn into ice cream for our Dublin party, I immediately thought of Bluebell Falls. We contacted the Keane family, and they kindly sent some down. There was a surprise, though – I had always tasted their plain goats cheese. They, however, suggested their honey and thyme cheese. When we made it into ice cream, we had prepared extra honey infused with thyme by cooking it over low heat. However, we didn’t need it at all. 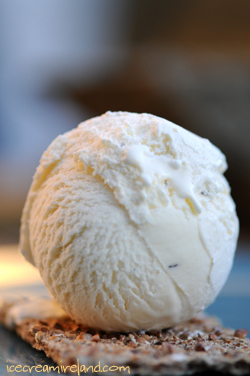 The ice cream was perfect without it, and it really underlines our philosophy that with great ingredients, there is no need to mask or complicate. One can simply enjoy! 1. Combine the egg yolks and sugar and beat until thick. 7. Allow to cool, then mix in the vanilla and goats cheese, using a blender or processor just until smooth. 8. Whip the cream until it has doubled in volume (you should have soft peaks – don’t over-whip). 11. 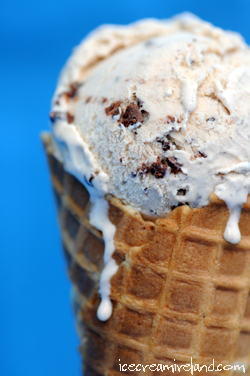 Freeze using a domestic ice cream machine, or cover and place in the freezer. 1. If you can only find plain goats cheese and like the idea of honey and thyme, you can always add some in to taste. 2. To pasteurise the eggs, heat the custard to 73C and maintain that temperature for at least 5 minutes. Use a cooking thermometer, though, and keep stirring! If the custard goes any higher than 76C, the eggs will scramble. Immediately cover and place in the freezer until cool. Do You Live In or Near Dublin? If you’re a Murphys Ice Cream customer living in or around Dublin, and if you’re not busy on Friday, we have something special for you. Click here.